My wife would tell you that there isn't an off season when it comes to giant pumpkin growing and that is somewhat true. When you aren't growing then you are thinking about growing. The best thing you can do when snow is on the ground is get ready for the upcoming season by doing a lot of research. 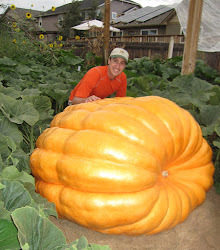 There is always something new to learn when it comes to giant pumpkin growing. Everything that it takes to grow a big pumpkin is wonderfully complex. The best thing to do from November to March is to research different growing techniques, amendments, genetics and ask questions of world class growers on sites like bigpumpkins.com and coloradopumpkins.com. There is a lot of misinformation out there and only by a lot of reading can you sort through it all. One thing, when I can find some time, I'll be researching this off season is hormonal responses within pumpkin plants. As the season progresses you notice after years of growing that the plants want to do certain things at certain times. There are ways you can enhance or slow down this responses by the amendments that you give to the plants and how/when you water them. By making little adjustments you can add a lot of pounds to a pumpkin if you do things just right. Another thing I'm thinking about this off-season is changing my watering system in the patch. I want to go to an under the canopy watering system so I can get more even watering later in the season. My plan is to add Dan Micro sprinkler heads under the leaves so I don't get so many dry spots under the canopy and keep one misting sprinkler to spray above the leaves during the heat of the day to keep the plants cool. I just got a shipment or Red Wriggler worms this last week to get my worm bins going again. Nothing better than earthworm casting to grow big and strong pumpkin plants. It is also the best thing in my opinion for compost tea. I killed my worms last winter during a cold snap so I've moved the worms from the garage to the basement to help keep them happy. Have a merry Christmas and grow em big in 2012!